Ozone acts 3000-3500 times faster than chlorine to purify water. Ozone can effectively kill certain bacteria in a wide pH range of between pH6 - pH9 and acts as a natural flocculant which means the elements which the ozone comes into contact with will end up on the floor of the swimming pool and be picked up by the pool cleaner. During this process the swimming pool becomes gin clear. 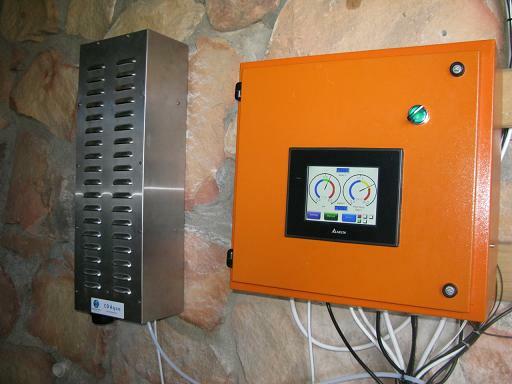 Wassertec's swimming pool ozone generator system is a first in South Africa since it is designed to be a fully automated pool management system and can be programmed to remotely activate pool lights and garden lights as well. The unit is controlled by a touch screen plc and is designed and built for South African conditions by South African craftsmen. Wassertec's automated pool unit can manage multiple pumps and/or stations including pool heating systems and pool acid dosing pumps which manage your pH for you.